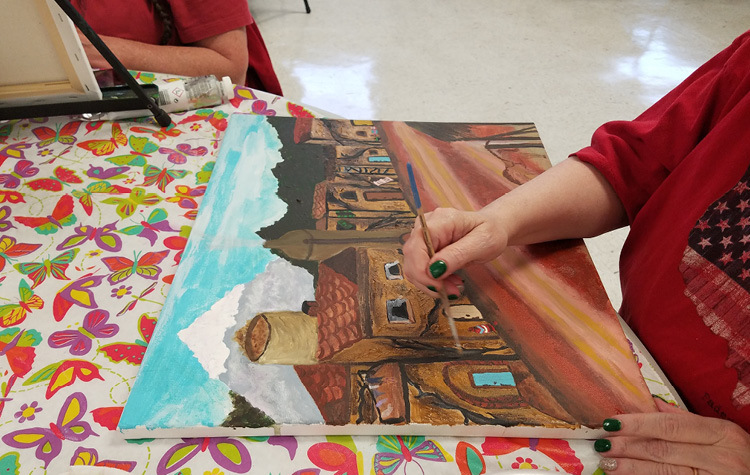 The Sapulpa Artists’ Guild Show and Sale on Friday and Saturday, March 29th-30th, was a big hit for the artistic community around Sapulpa. A. J. Uphold sold several paintings, Fern Patterson, Sherman Baker, Sam Houghton and others sold their works, too. Larissa Ford won Sam Houghton’s door prize (a $300 award-winning winter scene), Benny Baldwin won a stained glass cross by artist Tom Reed, James Bennett won a Rachel Pifer print. Cosmetics, prints, and other items were also raffled off to lucky winners. Many other artists displayed their wares, Lottie Wilds (handmade quilts and acrylic paintings), Clair Tosh (paintings), John Oivas (paintings), Donna Heim (paintings and drawings), Cheryl Warren (watercolors and notecards), Joni Rodriguez (paintings) and others have been busy. Thanks for all the work done to get the show set up and taken down in the Sapulpa Senior Citizens Center. This show couldn’t have been done without you. The next Show and Sale is tentatively scheduled for Friday and Saturday, May 24 and 25th (Memorial Day weekend) and will feature different artists and some of the favorites, too. Paintings, stained glass, note cards, prints, signs, watercolors, and other genres will be represented. Keep the Sapulpa Times close to keep abreast of activities in town. In the meantime, you are welcome to join the Guild, to learn to paint or watercolor for free from a local, living legend, Sam Houghton. Every Thursday night, year-round, Sam is in residence to guide and inspire you to be your best. And don’t say you can’t draw or never painted, because that was true of me as well 5 years ago.